Posted by cyberpatrol in cybercrime, Hacking, myspace, stalking. “Lori Drew decided to humiliate a child. The only way she could harm this pretty little girl was with a computer. She chose to use a computer to hurt a little girl, and for four weeks she enjoyed it.” U.S. Attorney Thomas O’Brien, chief federal prosecutor in Los Angeles, during closing arguments. Posted by cyberpatrol in cyberbullying, cybercrime, Hacking, myspace, stalking. A federal jury here issued what legal experts said was the country’s first cyberbullying verdict Wednesday, convicting a Missouri woman of three misdemeanor charges of computer fraud for her involvement in creating a phony account on MySpace to trick a teenager, who later committed suicide. Posted by cyberpatrol in cyberbullying, cybercrime, stalking. An American woman, accused of driving a teenage girl to suicide by bullying her on MySpace, has been cleared of one of the most serious charges against her. Lori Drew, 49, was found not guilty of accessing a computer without authorisation to inflict emotional distress. The jury failed to reach a verdict on another conspiracy charge. She was convicted on three minor counts of violating the website’s terms and conditions. Drew, from Missouri, was accused of posing as a boy on MySpace to befriend 13-year-old Megan Meier, who hanged herself after their virtual relationship ended. The court in Los Angeles heard that Lori Drew was aware Megan suffered from depression and was emotionally fragile. The case is the first in the US relating to cyber-bullying. Lori Drew could receive up to three years in prison when she is sentenced. She would have faced a maximum 20 years if convicted of the more serious felony charges. Posted by cyberpatrol in 4chan.org, Anonymous, cybercrime, stalking. He said he would do it. And he did. Abraham K. Biggs, a 19-year-old Florida bodybuilder, took some sleeping pills on live webcam, lay down and went to sleep. Just like he said he would. But the teenager never intended to wake up. And he didn’t. While others watched. And others turned away. And still others encouraged and taunted him. Abraham K. Biggs, known online as “CandyJunkie” and “Mr. Biggs,” told fellow users in an online bodybuilding forum on Justin.tv – a lifecasting website, where users share via webcam their everyday lives – that he would be committing suicide and invited them to tune in. Some users saw Biggs take what looked like sleeping pills, lay down on his bed with his back to the camera, and stop moving. After a few hours, some worried that he may have actually went through with his threat because of the stillness of his body. Authorities were notified and police entered the room — live on webcam. After checking for a pulse, they covered the webcam. Abraham K. Biggs has been reportedly pronounced dead by a Broward Country medical examiner. Biggs posted on MySpace that he was going to commit suicide three days before he actually went through with it. A post from a week before related how he had closed a chapter in his life and was apologetic to friends for his recent behavior. It is alleged that some users have deleted their posts from the forum. In light of the ongoing court case involving the suicide of 13-year-old Megan Meier as a result of alleged cyberbullying from neighbor Lori Drew, users fear that they may in some way be held responsible are well grounded. Testimony in the Meier case began Wednesday (November 19) in Los Angeles, although the suicide took place in Missouri. The alleged bullying took place on MySpace, where 49-year-old Lori Drew created the MySpace account of “Josh Evans” to allegedly ridicule and harass teenager Megan Meier. MySpace’s corporate offices are located in Los Angeles. Posted by cyberpatrol in cyberbullying, cybercrime. LOS ANGELES — Slumping forward miserably in the witness box, in barely audible tones, a young woman told a federal jury here on Thursday that she had posed as a teenage boy in a series of e-mail messages to a 13-year-old girl that ended in the girl’s expressing suicidal thoughts and hanging herself. “You’re the kind of boy a girl would kill herself over,” the woman, Ashley Grills, said the 13-year-old girl, Megan Meier, wrote before taking her own life. Testifying under an immunity agreement with federal prosecutors, Ms. Grills, 20, described how she came up with the idea to create a fake MySpace account with the identity of a cute teenage boy. The goal, she said, was to draw in Megan and learn about her and things she might have been saying about the teenage daughter of Ms. Grills’s friend and employer, Lori Drew. Ms. Drew, who lives in a suburb of St. Louis and was a neighbor of the Meiers, is charged with conspiracy and three counts of accessing a computer without authorization via interstate commerce to obtain information to inflict emotional distress. Legal experts believe the trial is an unprecedented use of computer fraud statutes to prosecute a case involving how people use a social networking site. Thomas O’Brien, the United States attorney here, asserted jurisdiction over a matter that local prosecutors in Missouri chose not to pursue — successfully arguing that he had jurisdiction because MySpace is based in Los Angeles, where its servers are housed. In her testimony on the second day of Ms. Drew’s trial, Ms. Grills described how Ms. Drew had become angry with Megan for “spreading lies” about Ms. Drew’s daughter Sarah, and was eager to “expose” her. Ms. Grills, who worked at the Drew home, said she hatched the idea of creating a phony MySpace account, under the name Josh Evans, to communicate with Megan. The original idea, Ms. Grills said, was to lure Megan to make nasty remarks about Sarah, which she and Ms. Drew would then present to Megan’s mother. But the idea morphed into other methods of humiliating the girl — devised by Ms. Drew, she said. Things went awry, Ms. Grills said, after she sent an e-mail message with Ms. Drew’s blessing that said, “The world would be a better place without you.” It was an attempt, she said, to get Megan to stop communicating with the made-up Josh so the ruse could end. Megan’s response, the message about suicide, had never been revealed by Ms. Grills until this week. Shortly after sending the message, Megan hanged herself on Oct. 16, 2006. As Ms. Grills told her story, Megan’s father, Ronald Meier, listened from the front row of the courtroom, rocking slightly and furiously dabbing at his eyes. Ms. Drew’s defense lawyer, Dean Steward, carefully tried to unravel the credibility of Ms. Grills and others witnesses, including Megan’s mother, Christina Meier, whose testimony continued from Wednesday. “Don’t you kind of have to say stuff they want to hear?” he said to Ms. Grills, motioning to prosecutors in a reference to her immunity agreement. Mr. Steward suggested that Ms. Meier ought to have known better than to leave her daughter alone in her room after a nasty exchange of e-mail banter left the girl distraught. He said the antidepressant drugs her daughter had been taking were known to cause suicidal thoughts in teenagers. “You let her run upstairs to the room alone,” Mr. Steward said to Ms. Meier. The trial has also included testimony about the fallout for Ms. Drew after the case became public. A hairdresser testified about the irate phone calls her salon received for continuing to tend to the hair care of Ms. Drew, and an interior designer detailed both how she sold Ms. Drew blinds to block the hostile approaches of neighbors, while being hectored herself for continuing to advertise her business in a coupon book distributed by Ms. Drew. Mr. O’Brien, the United States attorney, made the highly unusual choice to prosecute the case himself, punctuating his personal interest in the matter. Should he succeed in convicting Ms. Drew, the case, while derided by critics as an overreach, would almost certainly be a game changer in the still-evolving world of social networking. By essentially equating the violation of usage agreements with computer hacking into a computer, a guilty verdict in this case could have widespread implications for future prosecutions under the Computer Fraud and Abuse Act, said Matthew Levine, a former federal prosecutor. Each of the three counts against Ms. Drew carries a maximum sentence of five years in prison. Posted by cyberpatrol in Anonymous, cyberbullying, cybercrime. Los Angeles — A federal prosecutor says a Missouri mother hatched a plot with her daughter and an employee to stage an Internet hoax to prey on a 13-year-old girl who later committed suicide. U.S. Attorney Thomas O’Brien has told jurors during opening statements Wednesday that 49-year-old Lori Drew helped create a false identity account on the social networking site MySpace. Drew is accused of harassing her young neighbor, Megan Meier, with cruel messages in what prosecutors say is the nation’s first cyber-bullying case. Meier hanged herself in 2006 after allegedly receiving a message saying the world would be better off without her. Drew has pleaded not guilty to one count of conspiracy and three counts of accessing computers without authorization. Each count carries a potential sentence of five years in prison. Posted by cyberpatrol in cyberbullying, cybercrime, myspace. Last week, the judge in the MySpace suicide case had some concerns over whether the suicide of a 13 year-old girl was relevant to the crime charged. 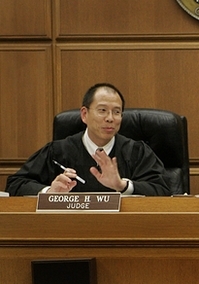 On Friday, U.S. District Judge George Wu apparently got past those concerns. He ruled that prosecutors can use evidence of the suicide in its case against Lori Drew. The trial is set to begin tomorrow. The charge against Drew — that she violated the MySpace terms of service — incorporates an allegation that she did it with an intent to harm. So AUSA Mark Krause reportedly argued that Drew is charged with joining in a conspiracy to cause intentional infliction of emotional distress. “Showing that this victim took the ultimate step of taking her own life shows the level of her distress,” Krause said. Judge Wu reportedly responded that he was convinced many prospective jurors would be aware of the suicide from reading news reports or seeing a recent episode of the TV show “Law and Order” that involved a similar scenario. He said he would instruct jurors that the case was not about the suicide and that Drew is not charged with causing the suicide. Posted by cyberpatrol in 4chan.org, Anonymous, cybercrime, Hacking. David Kernell, the 20-year-old University of Tennessee student who accessed Sarah Palin’s personal e-mail account, insists that what he did should not be considered “hacking”. According to Wired.com, Kernell’s lawyer has filed a motion that would prevent prosecutors and witnesses from classifying what Kernell’s actions as “hacking” and from calling Kernell a “hacker”. Apparently, the only thing that Kernell did was correctly guess Palin’s security questions by using Google searches to guide him. All Kernell needed was Palin’s date of birth, ZIP code, and the knowledge of where she met her husband—information that’s available online for anyone to view. After resetting Palin’s password to “popcorn”, Kernell posted the Alaskan governor’s e-mail and password on the 4chan forums—a large Internet discussion board that ranges in topics from Japanese culture to video games and sports. Kernell’s lawyer is arguing that hacking usually involves some sort of advanced computer skills to get past security codes and that guessing a password shouldn’t be counted as such. About 50 people gathered Thursday evening to remember Megan Meier, who would have been 16 Thursday. She most certainly, according to her mother, would have wasted no time in trying to obtain her driver’s license. The gathering was at a Dardenne Prairie baseball field on Hanley Road. A photo slide show of Megan’s life played across a sheet fixed to the back of the backstop. There she was: a toddler with her new baby sister, Allison; a little girl before the Christmas tree; a basketball player at the Boys & Girls Club of St. Charles; and an eighth-grade volleyball player at Immaculate Conception Elementary School. At times, her image on the sheet seemed to come alive, rolling with the wind. Megan was 13 when she took her life in October 2006, the victim of a MySpace hoax involving an adult neighbor, Lori Drew, a family friend who had lived four doors away in Dardenne Prairie. Drew, 49, is scheduled to go to trial for her role in the incident in Los Angeles Nov. 18. Cassie Thomas, 16, of St. Peters, recalled her friendship with Megan. She last saw Megan two months before her death. They saw a movie together. The goal is 1 million pledges. So far, Tina said, there are 425,000. People said they came to remember Megan, or to support Tina, or the Meiers, or to support Vicki Dunn, of St. Peters, Tina’s aunt. “We’re here in honor of Megan Meier and to help reduce cyberbullying – if we can in some small way – and to support the family,” said Jeff Brooks, 43, of Dardenne Prairie. His daughter is a friend of Allison Meier, 12. Posted by cyberpatrol in Anonymous, cybercrime, stalking. LOS ANGELES: A Los Angeles Superior Court Judge Friday issued a restraining order against Donald Myers, a member of a cyber-terrorist group known as Anonymous. The order requires Myers to stay at least 50 yards away from a female Scientologist he stalked and harassed. The order also requires Myers to stay away from the L. Ron Hubbard Life Exhibition at the Church of Scientology International building in Hollywood where the victim works, and stay 50 yards away from the woman’s home. The restraining order lasts for 3 years unless renewed. Depending on whom you ask, Massachusetts-based protest organizer Gregg Housh had a major victory – or a significant loss – in Boston Municipal Court this Wednesday. As reported in The Phoenix this past week in the feature “Battling Scientology,” Housh faced charges of harassment, disturbing the peace, and disturbing religious worship for his involvement with the picket group Anonymous and his actions against the Boston Church of Scientology. Legally speaking, charges against Housh were not technically dismissed. Instead he agreed to a Continuance without a Finding (CWOF), which the Massachusetts Criminal Defense Resource Page explains as: “Under Massachusetts Criminal Laws, agreeing to a Continuance without a Finding is not the same as pleading guilty. Technically, it is an admission that “there are sufficient facts to find you guilty” of the charges. Pleading to a CWOF will happen at a pre-trial conference as part of a plea agreement, if your attorney can get the prosecutor to agree.” (For more about the legal side see this article from Massachusetts Lawyers Weekly). A new study out of the University of California in Los Angeles finds cyberbullying is more common than previously thought. Almost 75% of teens reported some cyberbullying during the prior 12 months. The most common type of bullying was name calling. That didn’t surprise me, but the second most common type did. The second most common tactic was password theft. If someone steals or guesses your password they can send email in your name, visit websites and make it look like it was you, or edit an online profile and post untrue and unflattering information. Judge Thomas C. Horgan imposed a one-year continuance without a finding in the case against GREGG HOUSH (D.O.B. 10/17/76), who had been charged with disturbing an assembly of worship and disturbing the peace. If Housh stays away from the Back Bay headquarters of the Church of Scientology and its expected new headquarters in Boston’s South End, and if he does not re-offend in any other manner, those charges will be dismissed. If he does not abide by those terms, Housh’s case could be put back on track for trial. Also in today’s proceedings, Suffolk prosecutors affirmatively moved to dismiss an additional charge of criminal harassment against Housh. After a review of the evidence, prosecutors determined they could not meet their burden of proof beyond a reasonable doubt on this charge and could not in good faith move forward with it. Had the case gone to trial, prosecutors would have introduced evidence and testimony to show that Housh and others entered the Church of Scientology’s Beacon Street building in a boisterous manner during a March 1 protest, disturbing the proceedings and alarming those inside. Attorney Michael Dlott represented Housh. A teenager hacker has admitted carrying out a cyber attack that crashed Church of Scientology Web sites as part of a campaign by a mysterious underground group. According to a report on the News24 site, Dmitriy Guzner, of New Jersey, will plead guilty to computer hacking for his role in launching a distributed denial of service attack against Scientology sites earlier this year, the Justice Department said. According to information filed in Federal Court in Los Angeles, Guzner described himself as a member of a shadowy Internet-based group known as ‘Anonymous’ that has carried out a series of protests against Scientology. Posted by cyberpatrol in Anonymous, cyberbullying, cybercrime, cyberterrorism, myspace. Lawyers representing Lori Drew, the mother who is accused of using the social networking site MySpace to help cyber-bully a teen who then killed herself, filed a motion Monday seeking to throw out the indictment against her. Prosecutors said Drew and others schemed in 2006 to humiliate Megan Meier, 13, a neighbor in Dardenne Prairie, using a fake teenage boy’s identity on MySpace. Megan was first a friend, then a “rival” of Drew’s daughter, prosecutors have said. Federal and state prosecutors in the St. Louis area said they found no charge to apply against Drew, but the U.S. attorney’s office in Los Angeles, where MySpace is based, obtained indictments accusing her of one count of conspiracy and three counts of illegally accessing protected computers. Prosecutors say Drew violated MySpace’s terms of service, which prohibit lying when registering, soliciting information from someone under 18 and harassing other users. In the motion filed Monday, her attorneys argue that the government must do more than simply allege that the terms of service were violated. Drew’s attorneys also argue that the Computer Fraud and Abuse Act, which Drew is accused of violating, should not be used to punish “everything bad that happens on the Internet.” They also contend the indictment should be tossed because no theft was committed and the law Drew is being charged under requires a theft, as well as that recent legislation implies the law does not apply when the defendant and victim are in the same state. It was not clear late Monday when a judge could rule on the motion.